The final day of the first round action in the FIBA Europe U20 championship in Groups C and D in Zrenjanin determines which two teams have to play in the relegation group. The two teams that finish bottom of the Groups move to Novi Sad for the rest of the competition. Great Britain, France and Spain, already qualified for the next phase, are playing to win their groups. Spain had no problems overcoming Great Britain with fast breaks and steals (81-31) while Latvia just held on to win against the Slovak Republic (49-43) and are also through to the qualification round. 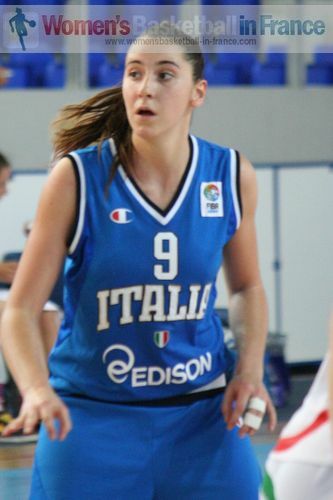 Italy almost had a free run after they got going to beat Belarus (82-51). The Netherlands' turnover percentage cost them dearly as they lost against France (66-58). With this day's results Belarus and the Slovak Republic are both playing in the relegation group. In Group C France take the maximum points, followed by Italy and the Netherlands while in Group D Spain is followed by Great Britain and Latvia to go into the qualifying round of this FIBA Europe U20 competition. Spain took their time to get going as Great Britain hustled as only they know how to. Laura Gil finally opened the scoring after almost three minutes. 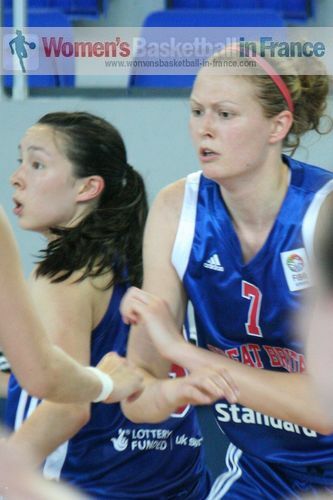 Great Britain hustled Spain but were unable to get an offensive game going with just 2 points by Jessica Hurd. Spain paced along with 4 points by Gil and 7 points, including a shot from the land of many by Vega Gimeno as they hit Great Britain 12-0 to lead (14-2). Great Britain woke up and scored 5 late points, including a trey by Deanne Hayward. Spain dominated the second quarter as their offensive machine went into over drive. Gimeno was at her offensive best with 9 second-quarter points. However Great Britain, with players in foul problems and injuries, struggled offensively despite back to back scores from Renee Busch. Spain finished the first half with an 11-0 run to lead (40-14) at the break. 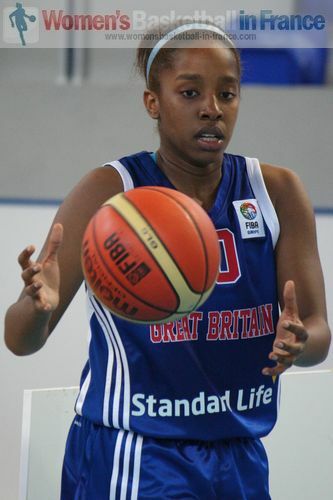 A Gemma Ballard trey at the start of the third quarter was the highlight for Great Britain. Afterwards Spain basically pressed Great Britain into turnover after turnover and scored 17 unanswered points. The contest was over with Spain leading (57-19). 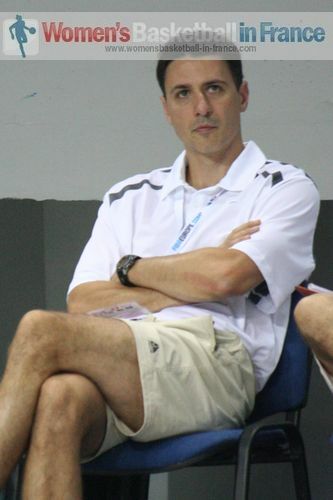 Great Britain committed a total of 11 turnovers as Spain cruised to a (67-25) lead going into the final quarter. Great Britain cut out the turnovers but were unable to do much against Spain. Spain's victory (81-31) gives them the group win and more importantly two wins for the next stage of the FIBA Europe U20 European Championship. 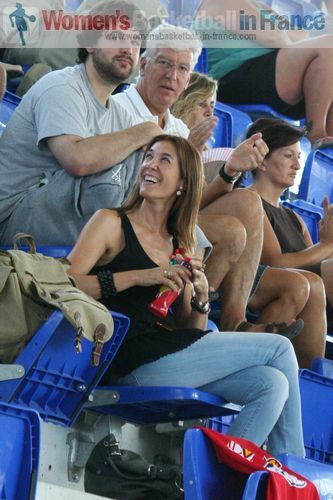 Vega Gimeno (left) led the Spanish attack with 18 points while Queralt Casas chipped in 16 points. Amaya Gastaminza was the only other player in double digits with 12 points. For Great Britain Deanne Hayward led the way with 10 points. With 10 seconds played Kristine Brance scored with a drive to the basket to get Latvia off the mark. Latvia had it all their way during the first three minutes and scored 7 unanswered points. This resulted in a time-out for the Slovak Republic. 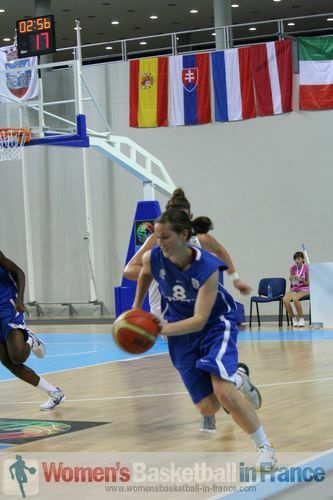 The Slovak Republic was not able to score from open play and managed just 1 point from the free-throw line by Dominika Baburová. Asnate Fomina (right) from Latvia had time to light up the game with a 24-second violation buzzer beater for the last score of the first quarter (15-1). Fomina still had time for one more action by concluding a fast break with a no look round the back pass. Unfortunately the officials called it traveling. The second quarter was much better for the Slovak Republic offensively with Angelika Oravcová and Barbora Bálintová scoring from the land of many as they reduced their deficit. The game became very stale with players running up and down just hoping something would happen. With the floor becoming more and more slippery, good ball handlers found themselves losing the ball. Latvia went into the locker room leading (23-13). After a slow start to the second half the game finally came alive after Martina Kissová scored with a spectacular drive to the basket for an AND-1 score (16-27) with just over five minutes to play. 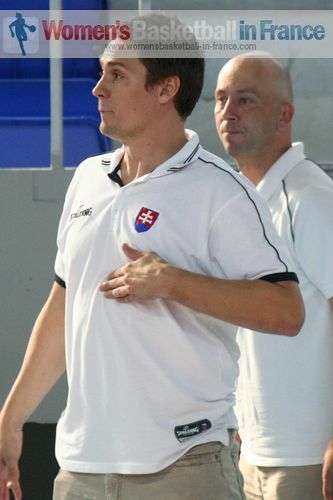 The Slovak Republic then took control of the game outscoring Latvia 10-2 to bring the deficit down to 5 points (25-30). The last 90 seconds turned into a firework display as both teams hit big shots. 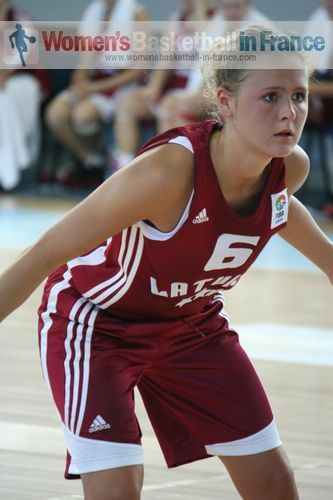 Anna Sonka hit a big three for Latvia. But on the buzzer Angelika Slamová hit also one from down-town. Latvia still led (35-28) going into the final quarter. Then the two teams played their best with end to end European basketball. In the end the action during the last two minutes decided the game with plenty of time-outs and free throws. 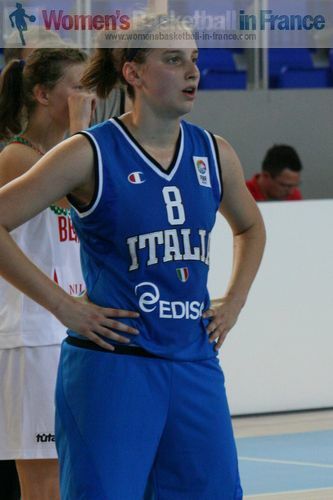 Dita Rozenberga missed two free throws but won the offensive rebound. She somehow got the ball to drop (43-38) and Latvia looked home and dry with 36 seconds to play. It got worse for the Slovak Republic as they failed to execute the next play and were forced to foul Anete Kirsteine who hit both shots from the charity stripes. However with 16 seconds left Barbora Bálintová managed to score and with 8.1 seconds left Oravcová (left) hit an incredible shot from down-town. Latvia went 4-of-4 from the line in the remaining time to hold on to win (49-43) and finish the first phase of the U20 FIBA Europe European Championship with one victory. The Italians did most of their scoring from beyond the arc with 3 three-pointers to stay in touch with their opponents by the end of the first quarter (11-15). In the second quarter they continued their three-point shooting festival with Laura Spreafico (right) and Tayara Madonna both hitting shots in a 10-0 opening. Italy hit more shots from the behind the arc (5 in total) as they went into the locker room leading (32-24). 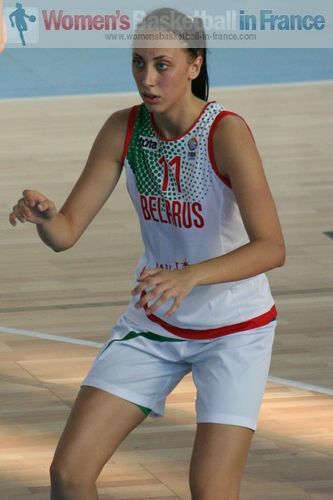 Belarus more or less conceded the match at the start of the third quarter and allowed Italy a free run. The Italians went 5-of-8 from beyond the arc as they demolished their opponents (29-13) to go into the final quarter leading (61-37). 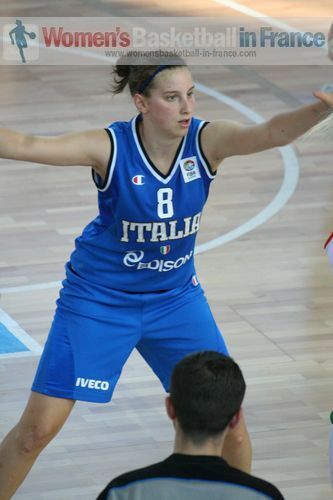 Italy went 14 of 32 from behind the arc to win (82-51). Chatilla van Grinsven (left) made an impact right from the start of the game bashing and pushing her way in the French half of the court to help herself to her team's first 6 points. Meanwhile for France Touty Gandega opened the scoring and was the driving force as France worked their way back into the game to lead (10-8) with 2:47 left to play. Maxime Essenstam took over from van Grinsven and the Netherlands gained the upper hand to edge the first quarter (16-14) off the trey from Randell van der Lee. The second quarter was fast and furious with nearly all the scoring coming in the paint. Neither team was able to hold the advantage for long. 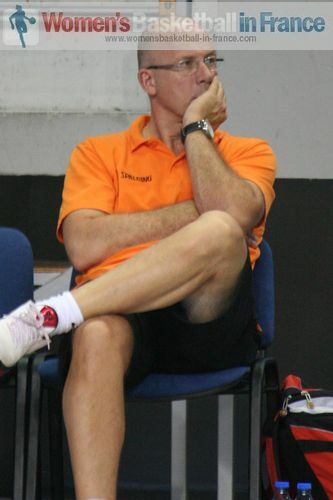 The Netherlands' zone defense caused France problems initially. So they were able to open a little lead (21-16) with 90 seconds played in the quarter. France stepped up and used all their strength inside to score 8 unanswered points to briefly go ahead (22-21). It was then cat and mouse right to the end of the quarter with France surviving a 2-point quarter ending buzzer beater lay-up attempt by Marlou de Kleijn to stay in front (30-28). The third quarter was end to end basketball with the lead changing hands no less than eight times as well as being tied six times. France, having no luck from beyond the arc, did their work on fast breaks and inside the paint. 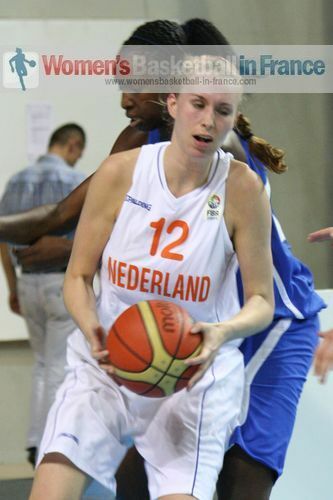 The Netherlands started the quarter well with Kourtney Treffers giving a display of her potential. However the Netherlands became involved in a dog fight with France: Ondaye-Akoa Elenga (right) won against van Grinsven at the end of the quarter to score for France and regain the advantage (47-46) going into the final quarter. 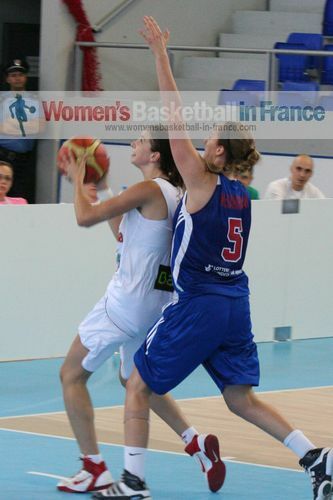 The last quarter belonged to Isabelle Strunc who fired in 3 three-pointers as France took control. 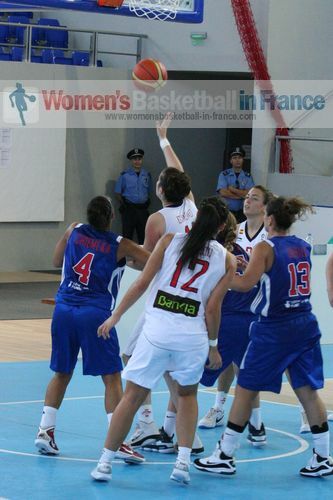 France had not hit beyond the arc during the first three quarters. Elenga was all over the place and scored 8 points in the final quarter to finish with a game high 20 points. 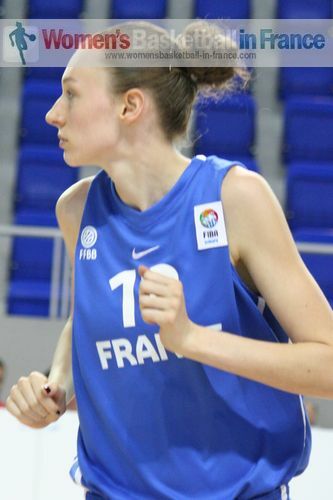 France were just too strong in the end and powered their way to victory to win (66-58) and also the group and take maximum points into the qualifying round of the FIBA Europe U20 European Championship for Women.